From the red couch to the hockey desk. If you were wondering what George Stroumboulopoulos was going to be doing after the George Stroumboulopoulous Tonight show (formerly The Hour) ends this season - we have news. 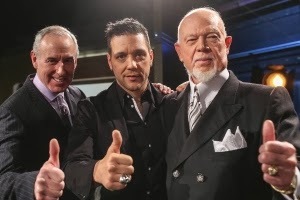 He is leaving CBC…he’s not going to CNN (that was a short lived dream, killed by ratings), but to Sportsnet to join Ron MacLean and Don Cherry for Hockey Night in Canada next season when Rogers gets the rights to NHL coverage. No that was not a sentence long typo. Strombo and Cherry. What do you think? No news on how this will actually be formatted. We all know Don loves to be the soul talker. I can’t imagine there being room for another sound on that panel that isn’t Don being Don and Ron’s sighs. What other big changes await Hockey Night once it makes the move to Rogers? In time, we shall see.